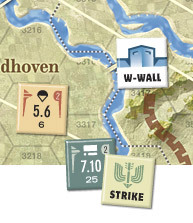 The enemy has committed a major blunder by continuing to fight west of the Rhine. -- General Montgomery, January 21, 1945. I want him [von Runstedt] to hang onto the West Wall as long as humanly possible. Withdrawal will merely mean moving the catastrophe from one place to another. -- Adolf Hitler, March 2, 1945. We're going to go through them like crap through a goose! -- General George S. Patton. Units are mostly divisions, along with some specialized brigades/ regiments (commandoes, heavy armor units, engineers). Players can form larger Corps level formations that enhance combat actions. The air war is also covered with air units on both sides conducting air superiority, ground support, parachute and aerial supply missions. The game design is easy to get into, but loaded with much decision-making for both players. The level of supply and logistical support determines how many units and leaders can conduct operations in the turn. Leadership on both sides, in the form of the various Army and Front Headquarters as well as the leaders from each, play vital roles in the various operations each turn. 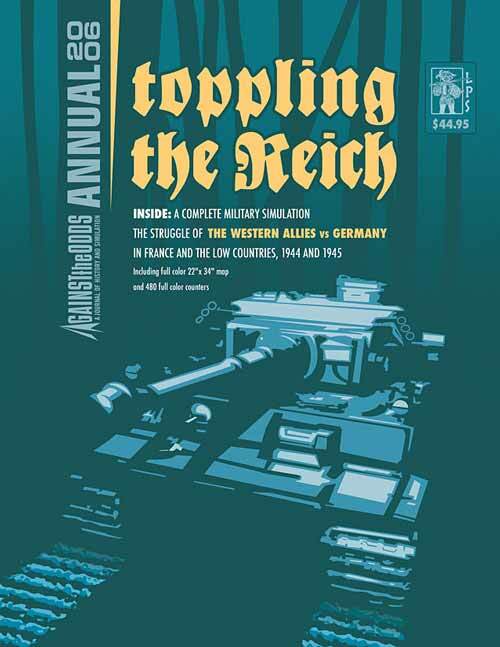 See more Toppling the Reich game graphics. Download the Toppling the Reich rulebook (in PDF format).